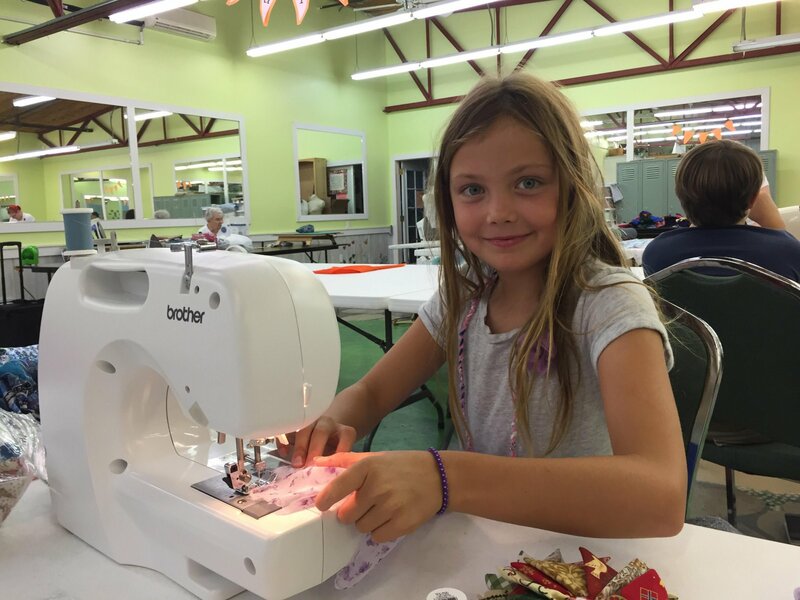 Dawn absolutely loves teaching kids how to sew and quilt, and she is very good at it! Over the years, hundreds of kids have come through the doors of the shop, eager to learn and excited about getting to make a project of their very own. There is a place for any child seven or older who wants to learn here at The Creation Station. Check out our ongoing programs below. You can always call or email the shop with questions! Dates: June 10-14th or July 29- August 2nd, 11am - 3 pm. Fee: $150 per child, not including fabric and supplies. Scholarships are available- call the shop for details. 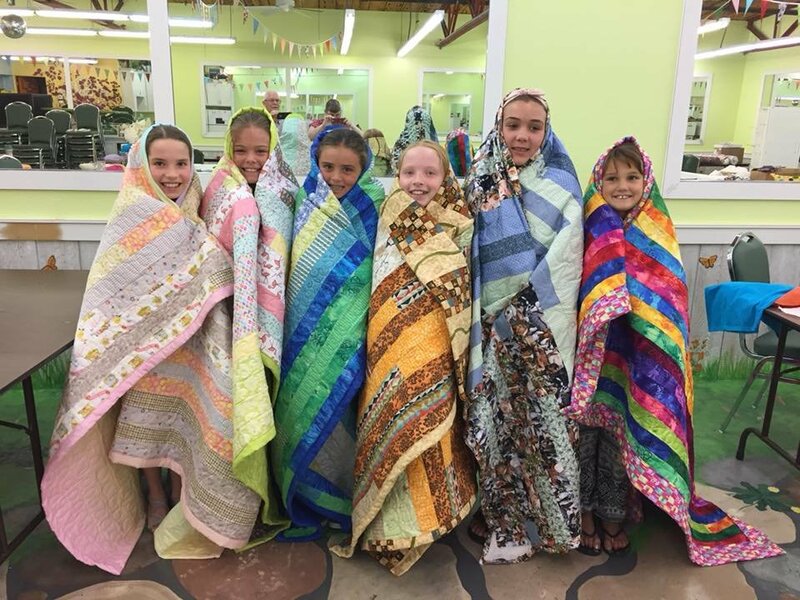 Age Requirements: The minimum age to attend our quilt camps is at least seven; however the decision is made on a person by person basis. This age restriction is in place for the safety and security of your children. The children need to be attentive enough to follow direction, have the motor skills to work a sewing machine (particularly the coordination required for the foot pedals) safely under appropriate instruction and supervision, and have the attention span needed for such tasks. The project for the summer quilt camp is a Modified Jelly Roll 1600. This is approximately a twin size quilt, but sizes vary as this may be their first quilt and seams are never straight without practice! They will be assembling the tops, making the quilt sandwich, quilting their own quilts on our longarm machine (something we don’t even let our adult customers do! ), and finishing their quilt with a fold-over edge. They will leave camp with their very own homemade quilt, a new set of skills, and a sense of accomplishment! They will be learning how to use a sewing machine safely. If they have a sewing machine at home that they have worked with before, we encourage you to send it with them to camp. The more familiar they are with the machine the easier it is for them. If your child does not have access to a machine at home, they are welcome to use our shop machines purchased specifically for them to use at no additional cost. We ask that you inform us that they will be needing a shop machine at the time of sign-up. We try to make everything fun and unique at our camp, and one of those things is lunch! The kids make their very own quesadillas with irons, foil, tortillas, and the fixings! It’s always a super fun time and something they talk about for weeks! If your child has special dietary restrictions, we do have refrigerators and a microwave available and you are welcome to send their own lunch with them. We ask that you inform us of these at time of sign-up to ensure they are not exposed to an allergen. Before camp starts, your child will need to pick out 7 half-yard pieces of fabric, an average cost of $40 total. We do not require that you buy the fabric from the shop, but you must bring it to the shop in time for us to pre-cut the fabric to size for them- at least a week before the camp starts. They will also need batting and backing fabric, which will be purchased from our shop to fit the top that they have made; this usually happens around day 2 or 3 of camp. We have found it is best for you to allow your child to choose their own fabric, even if it’s not a combination you would have chosen yourself. If they don’t love it, they don’t want to work on it! They will also need long sewing pins, a pincushion, and fabric scissors. The total cost of supplies (including the fabric for the top) typically runs between $125-$150. 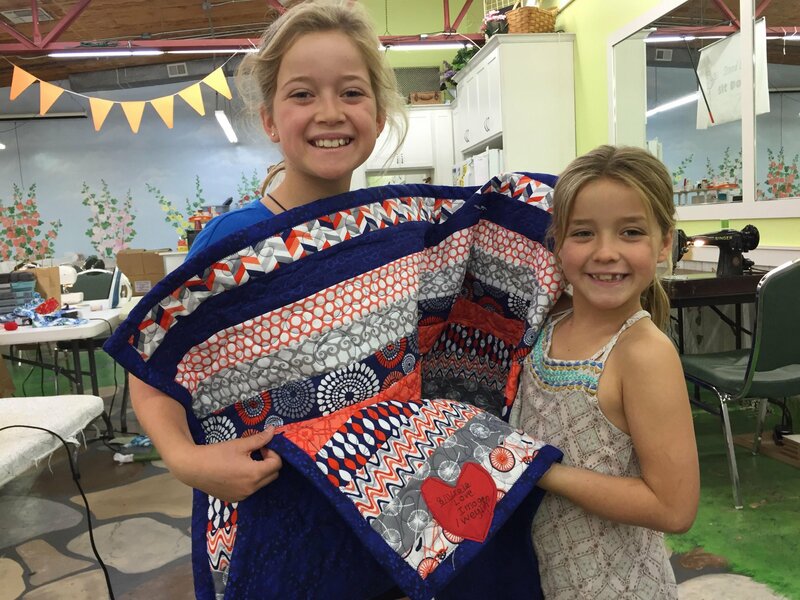 We do not wish to turn away children who want to learn due to cost, and we do our best to provide scholarships and supplies from donated fabrics when we can- call the shop for details. Thank You For Another Awesome Quilt Camp! You all worked so hard on your quilts and it shows! They are beautiful!